Rachel Von | The Journal Gazette Mad Ants' Rob Gray jumps up to shoot the ball as Warriors' Deyonta Davis tries to block his shot during the first quarter at the Coliseum on Sunday. Rachel Von | The Journal Gazette Mad Ants' Jordan Barnett tries to get around the Warriors' Kevin Young to get to the hoop during the first quarter at the Coliseum on Sunday. Rachel Von | The Journal Gazette Mad Ants' Stephan Hicks tries to pass the ball past Warriors' Michael Gbinije during the first quarter at the Coliseum on Sunday. Rachel Von | The Journal Gazette Mad Ants' Alize Johnson jumps up to shoot the ball as Santa Cruz Warriors' Damion Lee backs off during the first quarter at the Coliseum on Sunday. Rachel Von | The Journal Gazette Mad Ants' Alize Johnson shoots the ball over Warriors' Damion Lee during the first quarter at the Coliseum on Sunday. The Mad Ants had an opportunity to send a statement to the entire G League. But they came out flat today. Even after Davon Reed grabbed the public address announcer's microphone at the end of the first quarter, asking the Memorial Coliseum crowd to get more excited and empower a Mad Ants team that was down 11 points, Fort Wayne was never fully able to make up the ground. 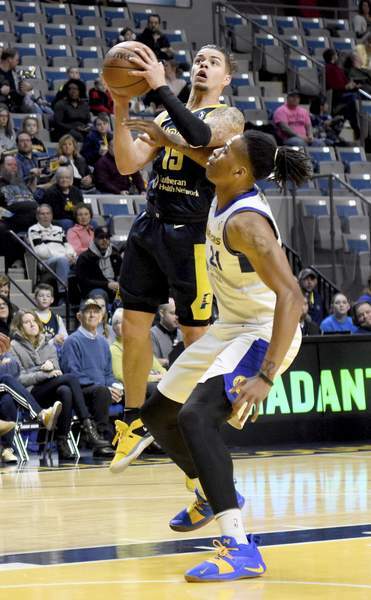 The Mad Ants lost 114-104 to the league-leading Santa Cruz Warriors in front of 3,805 fans on Hoops and Hounds Night, during which some fans brought their canines to the arena. Deyonta Davis had 26 points and 13 rebounds for Santa Cruz (26-10). Kendrick Nunn added 25 points. Damion Lee had 23 points and the Warriors shot 51.6 percent from the field. 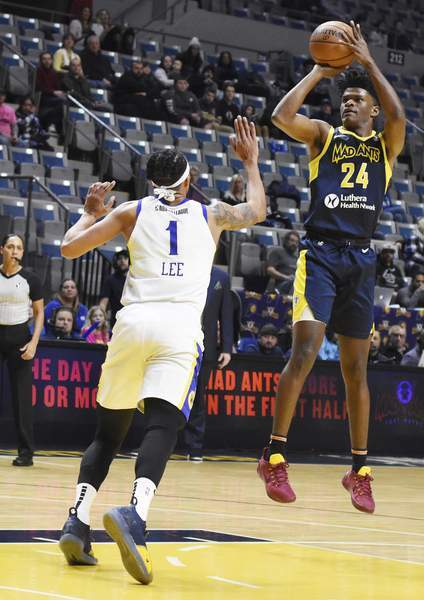 Fort Wayne (18-17), which shot 40.4 percent, lost Indiana Pacers rookie Alize Johnson to an undisclosed injury during the game, after he had five points and 11 rebounds. A player came down on his knee, Gansey said, but it wasn't clear if that was what took him from the contest. “I asked him in the locker room if he was alright and he said, 'Yeah, I'm good.' So we'll see,” coach Steve Gansey said of Johnson, who came in with 19 double-doubles in 23 games. 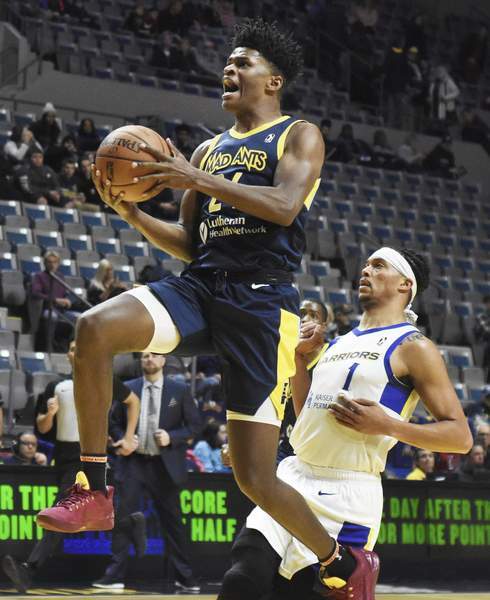 It had been a tumultuous week for the Mad Ants, who waived their starting point guard, Tra-Deon Hollins, who was second in the G League in assists (8.4) and steals (2.6) per game and, according to multiple sources, including his agent, Bill Neff, had failed multiple drug tests for marijuana. The Mad Ants also lost center Ike Anigbogu, who was a waived by the Pacers to facilitate other moves in the NBA. The absences of Hollins and Anigbogu might have explained some of the defensive problems today, but not necessarily the offensive ones. 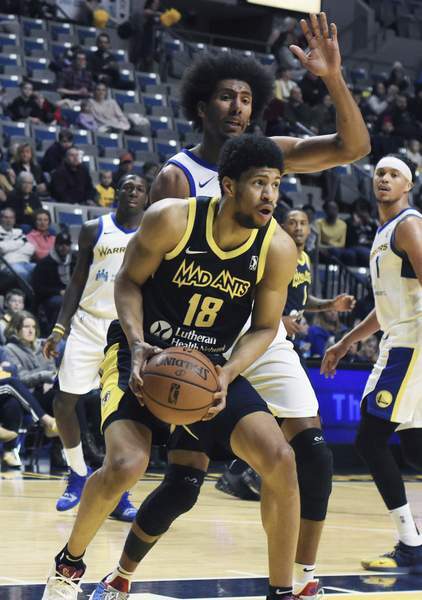 “I look at our assist-to-turnover ratio and 22 assists to 18 turnovers is not really what I was looking for,” said Gansey, whose Mad Ants have lost back-to-back games on the heels of winning 4 of 5. Hicks had 16 points and 10 rebounds. Reed had 16 points, nine rebounds and seven assists. Omari Johnson added 15 points. The Mad Ants play 7 p.m. Wednesday at Lakeland, Florida, against the Eastern Conference-leading Magic. 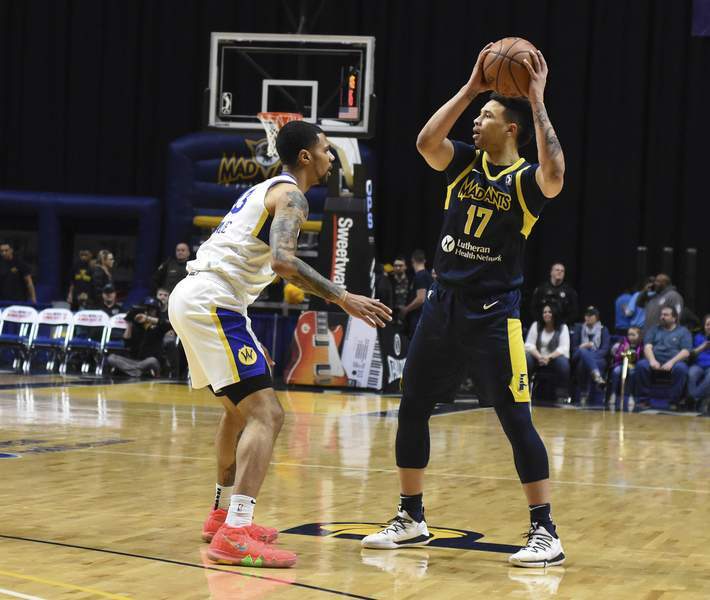 “We've beaten a bunch of the top teams in the league already, but we've just got to find our edge,” said Hicks, who joined Ron Howard as the only Mad Ants in history to go over 700 made field goals.